Yesterday, we got off to a great start beating Nippon Professional Baseball, 3-2, in an exciting game. Jermaine Dye hit a monster two-run home run and John Lackey, John Maine Scot Shields and Joe Nathan combined to hold down their hitters. After Jermaine’s home run, he was greeted at home plate by two little children with flowers — instead of boos! It was an electric atmosphere, including the ceremonial first pitch being thrown out by the Prime Minister of Japan I was very impressed by the Japanese All-Stars and I expect that the games will certainly not get any easier. Bronson Arroyo will start today followed by Chris Capuano and hopefully we can pull out another win as we continue the series. 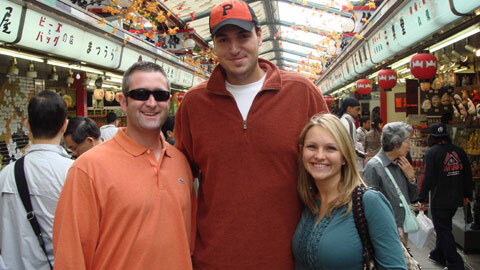 Brian and Jordan Schneider and myself at the market near Sensoju Temple. A trip to Japan would not be complete without a little — or a lot — of pearl shopping. Yesterday, we ventured out via subway to Roppongi to Yonamine’s PearlShop. Wally Yonamine was a former football player for the San Francisco49ers, who then came to Japan and played professional baseball before an injury ended his career. He and his wife, Jane, then opened a small pearl store in Roppongi. It was a very impressive experience in a small store, where the walls are covered with pictures and autographs from baseball players, actors and even Presidents. It was amazing to see photos and signatures of Joe DiMaggio, Warren Spahn, Roger Clemens, Jodi Foster, Hillary Clinton and Ronald Reagan to name a few. Needless to say, it was a fun experience and we completed most of our Christmas shopping. Mom, I hope you like pearls! Great job guys. Chris hope your having fun out there shopping. Nice to hear from you…. Congratulations on the win! I wish I could see the games on t.v here in the states but I’m glad to be able to read your blog about your experiences and on the game. Congratulations again! Awesome job so far out there! Im watching Game 2 as I type so there are people stateside that are watching the game! haha. I like the part about the Christmas shopping! Glad you and Liz are enjoying the Japanese experience. Keep up the good work! and congratulations on the recent win. Enjoy the electric atmosphere in Japan. The Japanese admire and respect the players and the game. Well done being an ambassador for the game (if not country). We’d love to see the MLB-Stars in a similar tour in Europe soon. Yearning and striving to make it happen. Great game on Saturday for the team! My daughter attended her first baseball game and you can tell your team mates that it was an experience she and I will always remember. Ryan’s bat was smokin’ today! He even hit a foul ball just a row behind us on the second deck that my daughter jumped for, trying to catch. That was on his fourth at bat. What an exciting experience we had today watching the game at Tokyo Dome. Hope you guys continue to enjoy this ‘halfway-around-the-world’ road trip. And best of luck to all of you guys on this series and the seasons to come. Stay healthy you guys and keep bringing those memories to all of us…..
Congratulations on the win!I wish I could have seen the game, it sounds like it was another great game. It sounds like you’re having a great time in Japan. I can’t wait to hear more from your experience in Japan and about the games. I live in Tokyo. I went to four games at Tokyo Dome. I was so excited with happy four days. I did not know that there was such a pearl shop with baseball players photos. Thank you very much for letting me know it. I wiil go to Roppongi to visit the shop next Saturday. I can not go to Osaka. Please Ganbatte! Ganbatte means “Good luck. Best wishes for your success” something like that. When you stay in Osaka and like to say “Thank you”, say “Ohkini.” That is Osaka dialect.